The Spectre HPR7440 fits some Infiniti QX56, Jeep Grand Cherokee, Jeep Grand Cherokee I, Jeep Grand Cherokee II, Jeep Grand Wagoneer, Nissan Armada, Nissan Frontier, Nissan Navara, Nissan NV1500, Nissan NV2500, Nissan NV3500, Nissan Pathfinder, Nissan Pathfinder Armada, Nissan Titan, Nissan Xterra, and Suzuki Equator models. See vehicle applications for details. This Spectre OE replacement air filter is an easy to install performance option for the stock panel shaped air filter in multiple Nissan, Infiniti, Subaru and Jeep applications. With its performance synthetic air filter media, this air filter has been designed to add horsepower and quicker acceleration by allowing more air flow into your engine than ordinary paper filters. 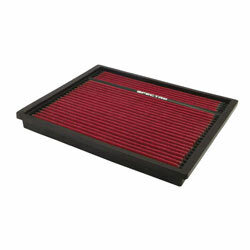 This air filter's sealing edge was engineered to insure a proper air box seal and great engine protection. Filter quality and price is great! Best filter I've ever used. Great performance and easy to clean.